A study was recently conducted by researchers at the University of Warwick which found that high and low mental wellbeing is consistently linked to an individual’s fruit and vegetable intake. The more fruit and vegetables a person consumes the lower the chance of having low mental health. The study findings indicate that eating fruits and vegetables not only benefits a person’s physical wellbeing but also their mental wellbeing. The end of summer break and the beginning of school is right around the corner for most school-aged children. It’s a time of mixed emotions for many parents but also a busy time as the pressure builds to make sure all the last minute supplies are purchased and the kids have everything they need to start back to school. Many families have a tradition of sending a small appreciation gift for the teacher on the first day of school. This could be a small bouquet of flowers, some baked goods, or even a drawing by the child. Of course around here, we’re partial to fruit gifts. Unfortunately, this is sometimes one of those things that gets put off until the last minute and you find yourself scrambling. Thankfully, the teacher won’t be expecting a gift so even if it doesn’t make it on the first day of school it will still be appreciated. When you send fruit as a gift to a teacher remember that they probably won’t be able to get it in a refrigerator quickly so select fruit that can sit at room temperature on the desk for several hours without spoiling. Apples are an easy traditional gift for teachers. Purchase a nice shiny apple with a sturdy stem and tie a note to the stem. Purchase several fresh crisp apples and place them in a small affordable basket to create a small fruit basket the teacher can enjoy for several days. Kelli over at Random Thoughts of a SUPERMOM! 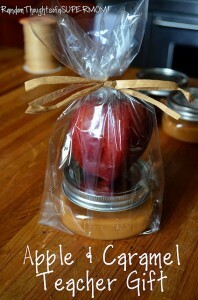 shared a really cute and inexpensive idea of an apple and caramel teacher gift, including the recipe for the caramel. What about grapes as a teacher gift? 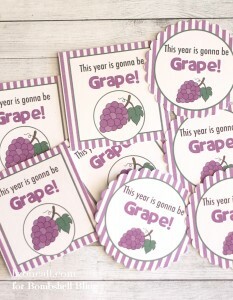 Sarah at Bombshell Bling shared a cute idea using grape flavored candies with a free printable that she created, “This year is gonna be Grape!” How cute would it be to use the “Grape Year” printable on a carton or baggie of grapes! Strawberries are still in season and with a play on words, lend themselves well to some cute tags. Create a cute little basket or carton filled with juicy red strawberries and a tag that says, “We’re going to have a berry special year!” Or “I’m berry glad I got you as a teacher”. There are lots of cute ways this could go. Search online for free downloads of strawberry gift tags. 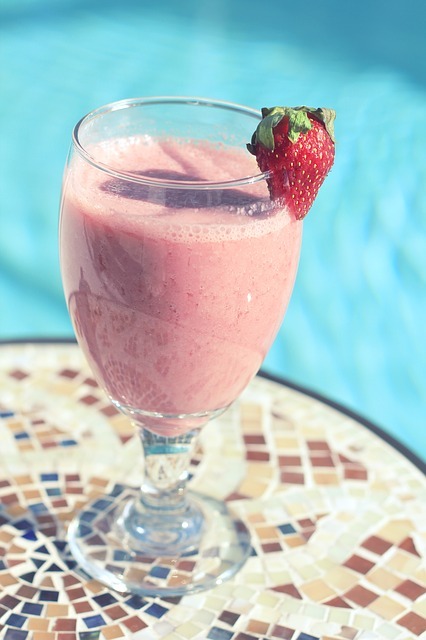 Other than fruit drinks, another summertime favorite is fresh fruit smoothies. Other than tasting delicious and being a great cool drink in the hot summer, fruit smoothies are a nourishing treat. Fruit smoothies provide essential vitamins and minerals that a healthy body needs. Depending on the fruits you use, smoothies can contain good amounts of vitamin C, potassium, folate, manganese, beta carotene, antioxidents and phytonutrients. Fruit smoothies also contain fiber which helps to slow digestion and helps to control blood sugar and lower cholesterol. Some people use smoothies as a meal replacement when trying to lose weight or maintain a healthy weight. When eaten in moderation smoothies also make a great snack. We recommend consulting with your physician before making them a regular part of your diet. To make a smoothie you will need a blender, fresh fruit, and a base. The base can be water, milk or yogurt. Adding milk or yogurt to your smoothie can be good for your bones as it will help you to meet the recommended calcium intake numbers. Should You Add More Fresh Fruit to Your Diet? March is National Nutritional Month. And whether one opts to send a nutritious edible fruit basket or adapt new eating habits, add these nutritional facts to your food basket. Which foods don’t fit the nutritional composite? Food preparation plays a leading role in nutritional sustenance. Salt laden, deep fried foods, prepared using trans fat foods that should be limited in any diet. For additional details about National Nutrition Month, please visit www.eatright.org/. Which foods pack the greatest nutritional value? Organic raw vegetables and fruit pack the greatest sources of vitamins, nutrients and antioxidants. What to look for in fruit? Fruits loaded with vitamins, minerals and nutrients. Blackberries, strawberries, goji berries, raspberries, cherries are laden with antioxidants. What are the best nutritional characteristics of vegetables? Vegetables contain different vitamins and minerals just like fruit. In terms of nutritional value, vegetables follow the same rule of thumb that fruit does: vivid colors are generally richer in antioxidants. Among vegetables leafy green vegetables such as kale, spinach and broccoli present an abundance of vitamins and nutrients. Best preparation: Fruits and vegetable offer the best nutritional value when consumed raw. Tarts, fruit salads (optional sprinkled with pine nuts or almonds) and fruit served with yogurt represent three simple alternatives for incorporating fruit. (That’s why fruit baskets make for an ideal dinner gift). What do your eyes, oatmeal, blood donations, soup and health share in common? Each deems January as the national month to focus on these topics, improving awareness. And in most cases, fresh edible fruit plays a moderate to non-existent role. January is National Health Month. With many Americans launching new well being programs as a 2014 resolution, January is an apt month to observe ones health. Edible fruit fact: Blueberries, blackberries and oranges contain rich sources of nutrients. In particular, these fresh edible fruits are known for antioxidants, which are supposed to aid in warding off chronic diseases (heart disease, diabetes, cancer).